I am researching s600 parts. I appears they may not be available at Autozone. The big announcement is that I have purchased a Honda s 600 project car from Dr Mugen. There is only a minimal chance that you will even fit in that car. I've seen it. Can't wait to see that car back on the road. It was in pretty decent shape back when I saw it about 8 years ago. It needs some attention. I need to finish the Porsche project first . It is a great little car, but I seriously think I had a peddle car that was bigger when I was a kid. 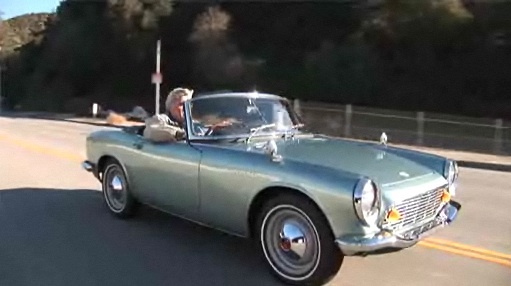 But if Jay Leno can fit in it, I bet you can too! Do you have a pair of Motorcycle goggles? Leno's 5'-11" and he sits higher than the windshield. I am 6ft 4 inches. It is not going to happen for me unless I make a custom seat and sit on the floor. My my goal is to enjoy the process of bringing the car back to life and learning about its unique solutions to engineering problems . I am taking the day off to go to the track tomorrow in one of my red cars. Then on Saturday I will be at the track again sharpening my driving skills. I want to knock off about 5 more seconds per lap. Then I will be respectfully fast. Better take both red cars. It is a two day event and you know better than to expect either car to last more than one day. You will still be in a red car, so you will only be sorta fast. Can I suggest using the infield? A shorter course will definitely lower your lap times. Speedracer doesn't go fast enough to consider the infield as a route. He's too busy making sure he doesn't overheat his engine or brakes. Okay. I am back from day one at the track. I went with an old friend screen name Hastarock. As it happens he arrived in a silver spec miata. I brought my red miata. Hastarock is and has always been a faster driver so I was there to have fun . We went out together and to my great surprise the silver car after a few laps stopped dead on the track. It was towed back to the pits and was revived. So for you silver lovers, the silver car broke and the red car did not break. We have a fantastic day . The weather was perfect cool and sunny. Lots of open track no traffic just fun playing lead and follow. Near the end of the day I had an issue with induced throttle oversteer . This resulted in an off track adventure that resulted in a new line that cut off one one of the corners. Therefore the assumption that I would cut the corner was correct. After the track went cold I had to wait to sign in for the event tomorrow. There was one other car on track late in the afternoon. It was a Ferrari . It turns out that he was also there checking in for the event tomorrow. While we waited he offered to take me for a little ride to get some gas. So I got to take a ride I in a red Ferrari 458 especial . Wow just wow . 9000 rpm redline 600 hp giant brakes and a giant NA Ferrari engine. So let's just say for a red car driver it was a very great day.